The substrate obtained after pasteurisation and conditioning can be used as an inoculable product. It is a good basis on which many strains can be cultivated. 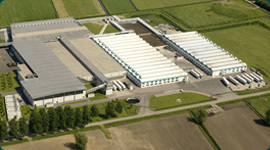 Hooymans Compost B.V. supplies the compost to the grower, who can inoculate it with the strain he wants. It is also possible for us to obtain the desired strain and to spawn the compost ourselves.